American retailer Sweetwater leaked news of Maschine Studio yesterday; today, it’s pocket-sized, affordable versions of Moog effects that seems to be out of the bag. Yes, it’s a rumor, non-official, unconfirmed, yadda yadda – but this one’s hard not to believe at face value, it makes so much sense. Delay, US$199: bucket-brigade analog delay. Tremolo, $179: Tremolo pedal with sub. Boost, $139: Both volume pedal and “boost” functions, each with either a more Moog-like voltage-coltrolled amplifier or a classic-sounding operational transconductance amplifier for overdrive. Drive, $169: pairs an operational transconductance amplifier (for overdrive) with the Moog Ladder Filter. Ring, $149: The Moog MF-102 ring modulator, essentially – pocket edition. How does double-entry accounting work again? Shall I just deduct a few of these figures from my bank account now? 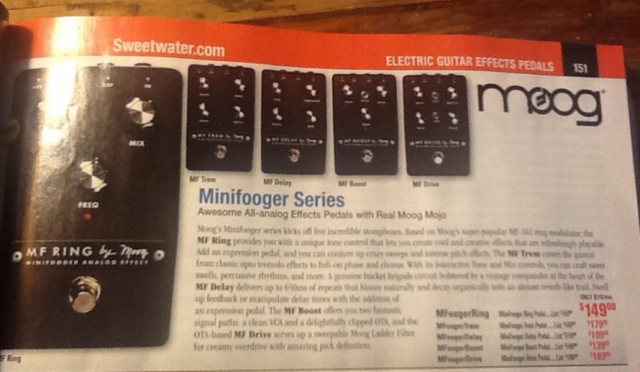 These all look handy, and would make even more sense than the current Moogerfoogers for a broad audience of guitarists. I’d be especially glad to get a ring modulator for $150 or the Drive, since those are tougher to find in outboard units, at least at this price. And we continue to see hardware that you can use in sound design without necessarily needing a suitcase analog modular rack. And “by Moog” is new branding and typography.